As has been mentioned on the overview page, the coal deposits at Rio Turbio were discovered back in the 1880s by Agustin del Castillo, but were not exploited until about 1943 when the shortage of imported coal made the task worthwhile. The coal is of sub-bituminous to bituminous quality with a calorific value of about 6,000 kcals/kg. It is used in electric power generation and in the metallurgical industries, though it is largely unsuitable for making conventional coke. The reserves are estimated at about 752 million tonnes. The two main coal seams, the 'Dorotea' and the 'A', are near horizontal and they outcrop along the side of the Rio Turbio valley, extending over the hill and into Chile where there is a small amount of exploitation at Mina Dorotea. The mines are therefore accessed by horizontal drifts or adits rather than vertical shafts. Underground the extraction of the coal is by retreating longwall methods with controlled collapse behind the faces. 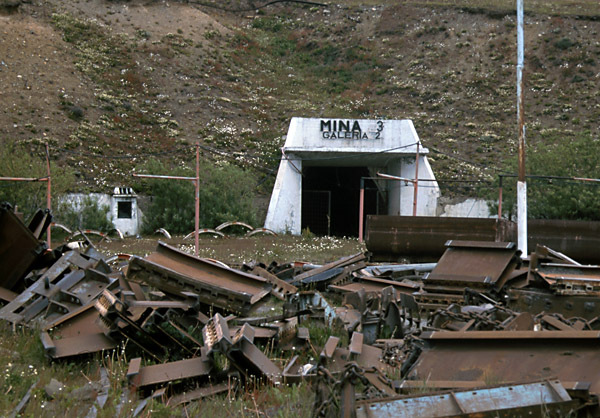 The entrance to Mine 3. 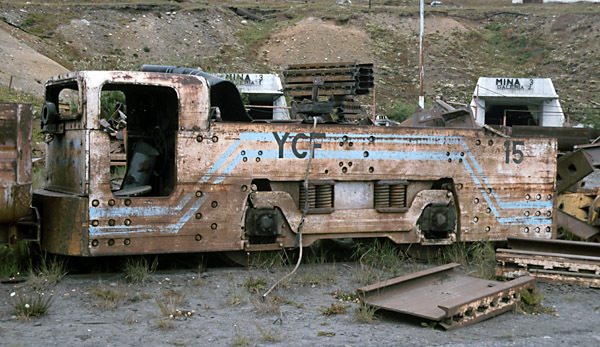 The initial exploitation and operation until the early 1990s was under the control of Yacimientos Carboniferos Fiscales - the Argentinean national coal company. The mines are numbered, 1, 2, 3, 4 and 5. Mines 1 and 2 are at the head of the line, whilst nos. 3, 4 and then 5 are a couple of kilometres further east at Bacigalupo. Obviously production has varied with demand and the varying prices of orher fuels. As at year 2001 only mine 5 was producing coal. The mines had their own tracks underground and leading up the side of the valley to the washery etc. These were of 75cm. gauge, identical to the mainline railway, and were initially operated by diesel locos, later replaced by small electrics, using overhead power lines. Four tonne mine cars carried the coal to a tippler at a 4000 tonne storage bunker, from whence it was fed to the washery. 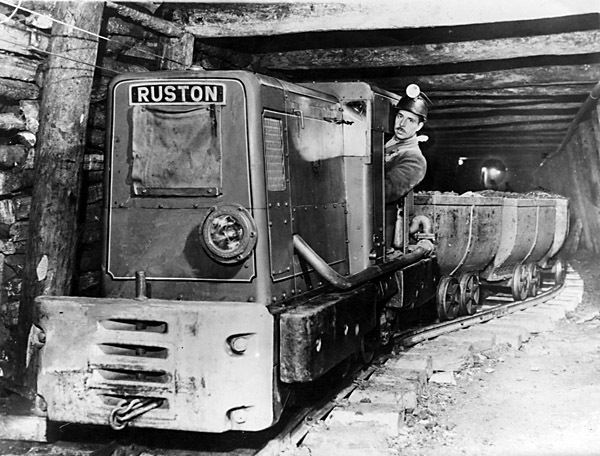 This early picture shows a flame-proofed Ruston in one of the mine tunnels (3). 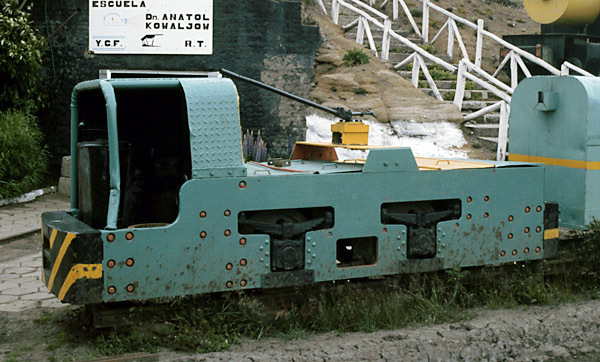 A Ruston diesel is also shown below on the surface, in a picture from the collection of the Amigos del Ferrocarril in Río Gallegos (1). Whilst it appears to be from the same batch as that above, the low cab roof seems to have been removed for use above ground. One of the early electric locos, with a train of four tonne tippler wagons (3). Later electrics had cabs for the driver. 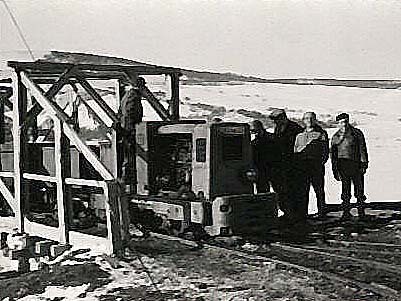 Early mine cars were side-unloading. Later ones were of a much more rounded shape and were emptied by means of a tippler. They therefore had no doors at all. 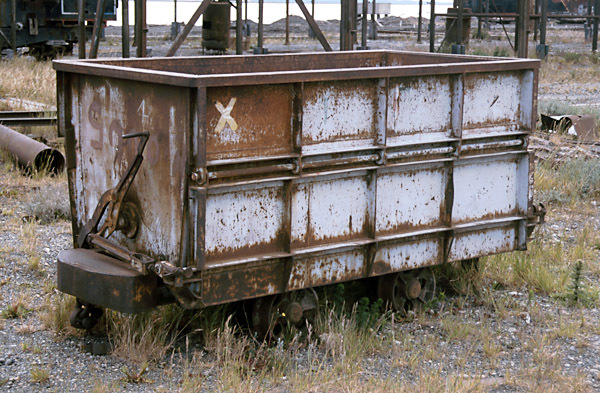 One source suggests that the mines eventually possessed 800 tub wagons and about 80 'tippers' (4). The railways were used to take equipment into the mines, to transport workers in and out, and to bring out the coal and waste. There were therefore a variety of other vehicles besides the hopper wagons. 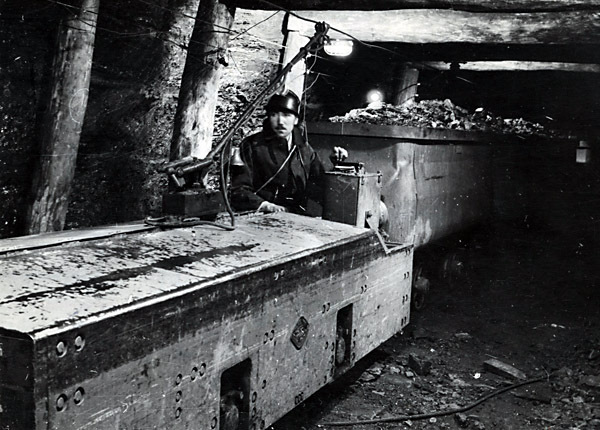 The picture below shows a typical man-riding car, used for carrying the miners at the beginning and end of each shift. This newly-painted example is on display at the mining museum outside mine 3. There were at least three types of electric locomotive used of around the four ton size. One of these types was of Russian manufacture. 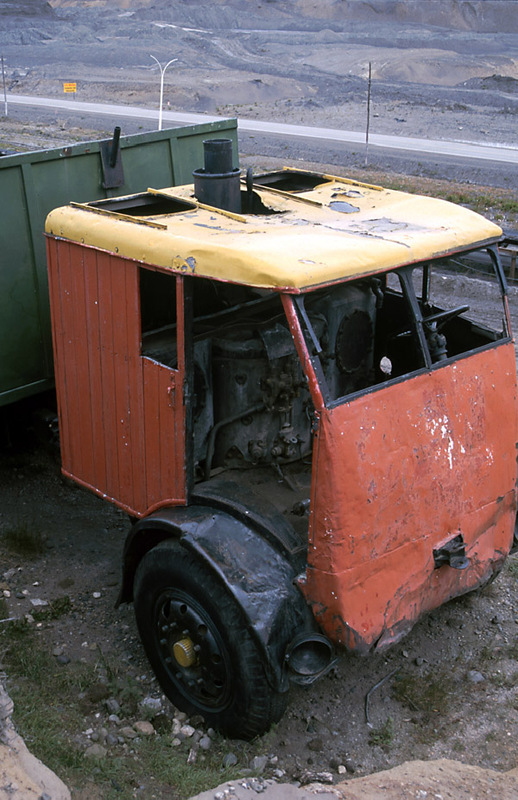 A Russian loco is shown below. The suspension is very like that used by General Electric (USA) mine locos. I believe this to be one of the AEG locos, but have no further details. 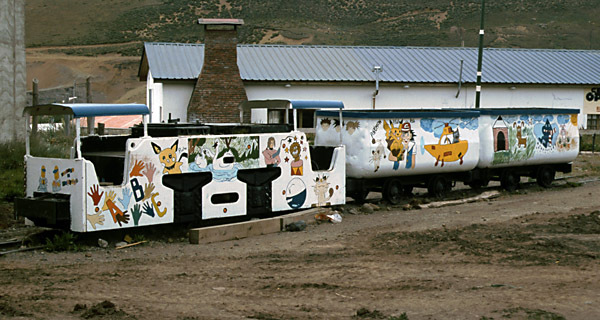 An example of a third type of loco, this time with two cabs, lies in the children's playground at the upper end of Rio Turbio town. The twin cab loco in the playground. The colour scheme is unlikely to be original! 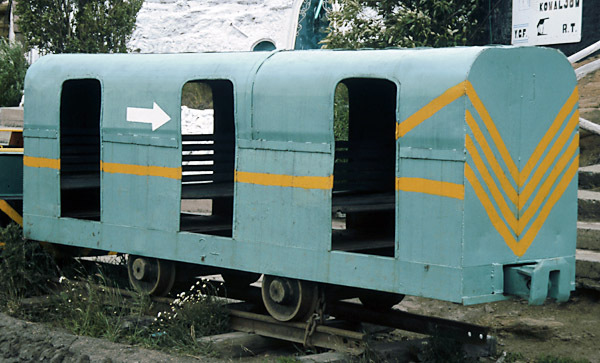 Two of the later style tippler wagons are also displayed. The mines were privatized in 1994, and are now operated by Yacimientos Rio Turbio SA. 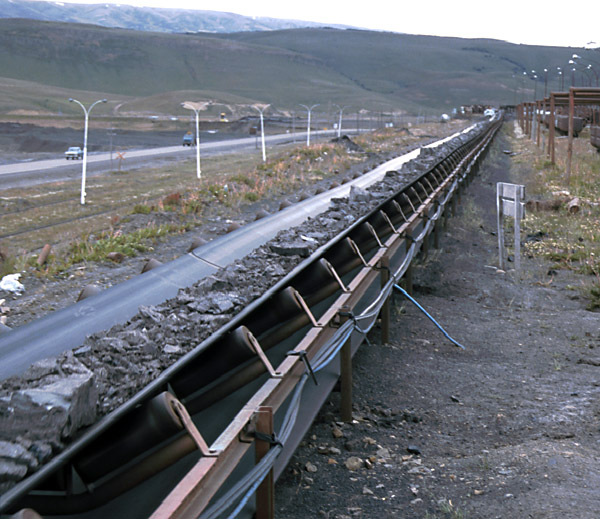 David Sinclair reports that by 1996 much of the underground rail network had been replaced by conveyor belts. It seems likely that some parts of the system are still used for carrying equipment underground but certainly most transport of coal is now by conveyor, and in many modern mines the workers travel by that means as well. The main outside conveyor brings coal up the valley from each mine entrance to the washery Many of the old mine tub cars are dumped at mine three upside-down next to the conveyor belt, below. One of the original 1950 Sentinel steam lorries is retained at Río Turbio for interest, along with Henschel 0-6-0T no. 19455, though lacking its chimney. 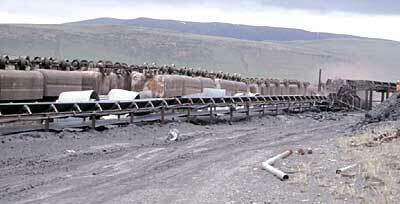 The sole survivor of 'Los Chufi', the 1950 Sentinel steam wagons which first hauled the coal to Rio Gallegos. The boiler, water tanks and chimney can be seen. Other photos of this vehicle are displayed on the initial RFIRT page. 1 El Tren del Fin del Continente, a CD-ROM of photos collected by the Amigos del Ferrocarril in Río Gallegos. 2000. Edgardo F. Gallardo. E-mail him (in Spanish) at <tandem@ciudad.com.ar> for details. 2 Unpublished notes by Dr. John Davies, courtesy of the SLS. 3 Photos reproduced by kind permission of the Archivo General de la Nación in Buenos Aires. 4 Con corazón de carbón, by Sergio Garcia, a comprehensive study of the RFIRT in Todo Trenes magazine no 68, June 2009.